Home » Hasbro » CONTEST: Win a Transformer... sort of. CONTEST: Win a Transformer... sort of. 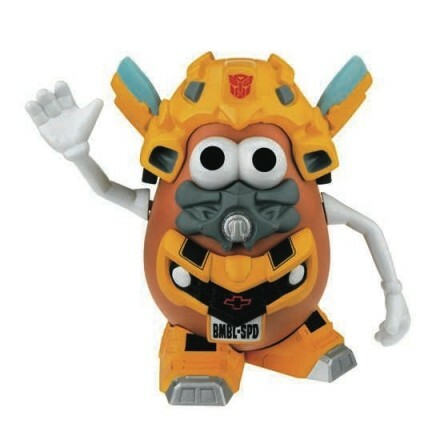 Send us your favorite Super Robot/ Potato name and the winner gets a free Bumblespud courtesy of Hasbro. - Robot name must have some potato reference to it. - one entry per user. - Runner up gets a free CDX T-shirt. - anyone can enter, regardless of location. To enter, send your suggestion to contest@collectiondx.com along with your name and email address. DO NOT POST ENTIRES IN COMMENT SECTION. ENTRIES IN COMMENTS ARE NOT VALID AND WILL NOT BE CONSIDERED. No one is gonna win this contest. Thank you for the offer, but this is way below my interest so I'll quietly pass. Good luck to those who submit. I'd rather be the runner-up. Saw the pic and threw up in my mouth a little. Ok we had some interesting entries, not that many though. No love for bumblebee? and the winner - Daiapotato! Runner up - Great MASHinger! Congrats to users "tattoo_mixa" and "reddy.hkcs"
Thanks again to Hasbro for providing the prize! Oh, yeah- thanks, Hasbro. Thanks for the "prize"? Who the hell do they think visits this site that they would send us this! ?